Thousands of pupils face being taught by unqualified teachers or in ‘super-sized’ classrooms as schools struggle to cope with unfilled teacher vacancies. The teacher recruitment crisis has deepened to “worrying levels”, latest figures have revealed, with schools facing an increasing struggle to fill vacancies. As pupils across the country return to the classroom this week, as many as 300,000 will be left without a permanent teacher, analysts have warned. Vacant teaching posts have risen by almost a quarter over the past two years, and are set to worsen as the school-age population rises. Using data from a quarter of the UK’s schools, analysts for education recruitment service Eteach said there will be 13,969 teacher vacancies at the start of the school year – almost 24 per cent, up from 11,275 in September 2015. Union leaders said the Government was “in denial” of the problem, causing children’s education to suffer as a consequence. “Ministers have no clear plan to address these issues and the Government’s analysis of current and future teacher supply needs is seriously flawed,” said Chris Keates, general secretary of the NASUWT teaching union. More than 1,800 teachers were surveyed for the same company – two-thirds of whom said they were thinking of leaving their current job in the next three years, suggesting the problem is set to worsen even further. Excessive workload (48 per cent) and low morale (38 per cent) were given as some of the reasons for planned resignations, with 80 per cent of teachers taking work home with them on weekends and during holidays. However, more than half of those polled (56 per cent) said they would still recommend the profession to a friend. Paul Howells, founder and chief executive of Eteach, said: “In my 20 years of working with schools on teacher recruitment I have never seen so many unfilled vacancies. ”Teaching is failing to attract enough graduates, and schools are struggling to hold on to their current teachers, creating a perfect storm of pressures. Earlier this month, the Government was accused of failing students after figures showed a 10 per cent drop in the number of graduates entering teacher training compared to last year. 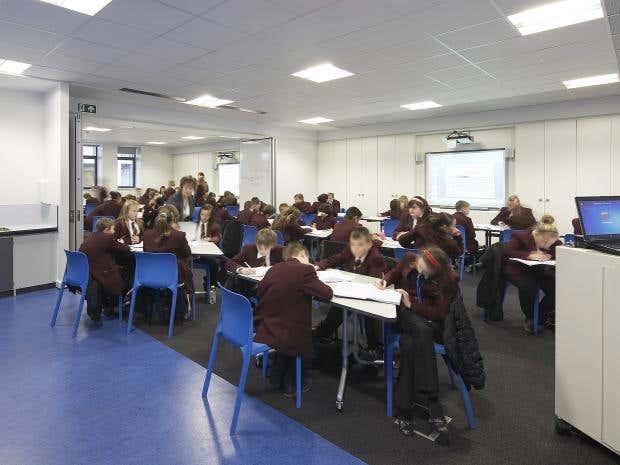 More than 600,000 pupils are said to be taught lessons by unqualified teachers, and half a million primary school children alone are being taught in “super-sized classrooms”, as schools desperately try to adapt to having low staff numbers. Liberal Democrat education spokesperson Layla Moran said ministers “urgently” needed to address the shortage revealed in analysis of Ucas data by the party. According to the figures, 780 fewer new teachers are expected to be recruited into teacher training this year – down to 7,165 from 7,945 in 2016. Labour Party figures published last week show that teachers are more than £5,000 worse off in real terms than in 2010 due to public sector pay policy. Dr Mary Bousted, joint general secretary of the National Education Union, said: “Falling pay levels and heightening workload pressures have been causing problems in recruitment and retention for some time, while cuts in funding are making matters worse. “Combined with excessive workload and a system which reduces education to narrow measures of success, it is no surprise that head teachers cannot fill vacancies. “Obscuring the scale of the problem by delaying the DfE survey in November, when most schools have been forced to take steps to reorganise classes which lack teachers, does no favours for the Government, our schools and the communities of staff, pupils and families they serve. A Department for Education spokesman said: “These figures do not reflect the fact that the teacher vacancy rate in 2016 remained low – at 0.3 per cent. The number of teachers entering our classrooms is outnumbering those who retire or leave, and there are now more teachers in our schools than ever before – 15,500 more since 2010.